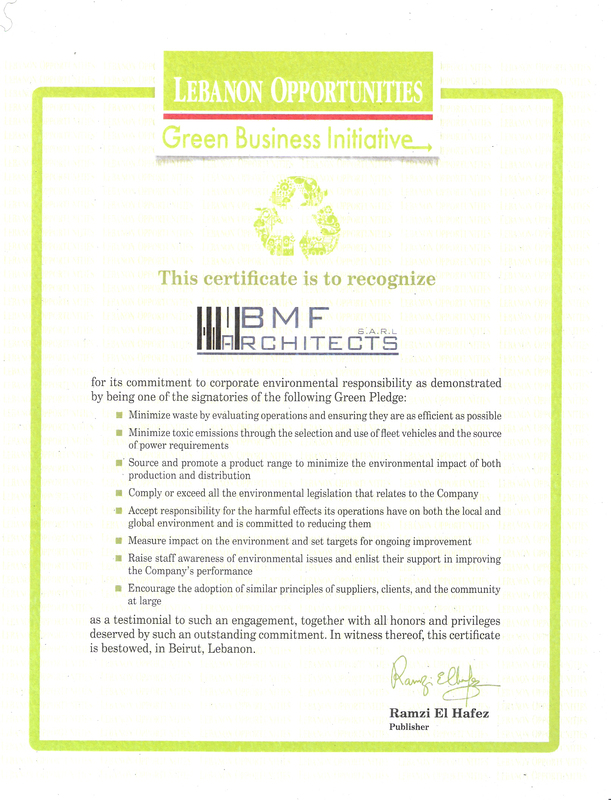 Certificate of GREEN BUSINESS INITIATIVE handed by the Lebanon opportunities in “Green Business opportunities 2016” to BMF Architects s.a.r.l for its commitment to CORPORATE ENVIRONMENTAL RESPONSIBILITY being one of the signatories of the GREEN PLEDGE. Thanks to the trust of our clients, and the unlimited efforts of our team and all stakeholders, BMF Architects s.a.r.l was nominated & awarded Best engineering & Construction services firm from the MEA Business Market #2015 Award. 2016 the best is yet to come . Environmental accelerator that helps create a framework for home-grown solutions that address today’s most urgent energy and environmental challenges in Lebanon.